Jupiter's ring system is composed of three parts: a flat main ring, a toroidal halo interior to the main ring, and the gossamer ring, which lies exterior to the main ring. The gossamer ring is the extremely diffuse and uniform band that stretches across the center of this mosaic, starting from the main ring and halo on the right-hand side. 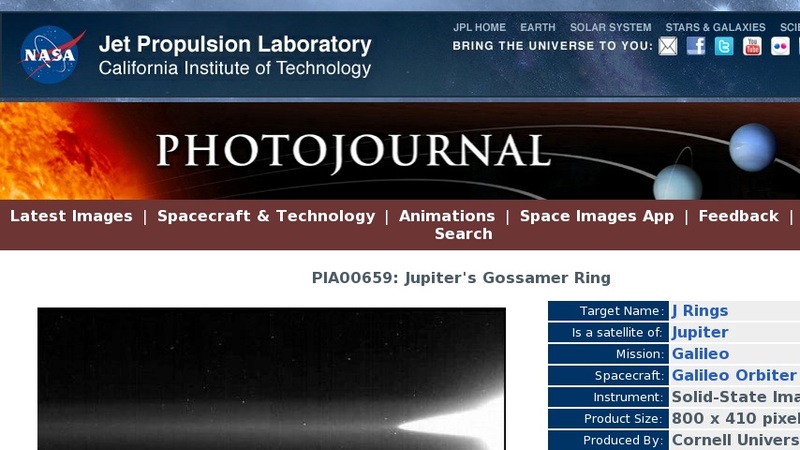 The gossamer ring had been seen previously only in the single Voyager image in which it was discovered at a very low brightness level; there its brightness appeared to drop from about one-tenth the main ring's value until the ring totally vanished at a distance of about three Jovian radii. The gossamer ring is clearly visible in this Galileo view; the left side of the image corresponds to a radial distance of about 2.2 Jovian radii. The outer edge of the gossamer ring is beyond the edge of this mosaic.